Midland Patio Awnings is a trading name of Supreme Blinds and Interiors, a local family business offering a level of personal service that other companies struggle to match. We have been in the business of installing blinds and awning systems for 25 years and we have many very satisfied customers throughout the Midlands. 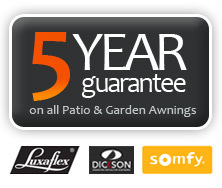 We offer a 5 year guarantee on our awning systems, covering the awning mechanism, the awning fabric, the control system and the installation work. For awning fabric we use Dickson Orchestra, a leading brand in awning fabrics.